The Catholic Cemetery of St. Matthew parish affiliated with the Catholic Diocese of Milwaukee believes in Jesus’ promise that He has prepared a place for each of us. Recognizing that our bodies are Temples of the Holy Spirit, we are dedicated to providing respectful care for the grounds which contain those mortal remains. We believe in the resurrection and eternal life and are committed to the respectful care of the people of God who even in death remain a part of our Christian community. 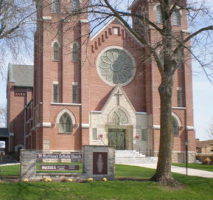 St. Matthew Cemetery was established in 1866. Three plots of land have been purchased since the original in 1866, one in 1899, and another in 1922, the final five acres was purchased in 1977. The five acres purchased in 1977 is currently being rented out as farm land. St. Matthew Parish has recently created a cemetery board. The cemetery board was created to establish by-laws, and maintain compliance with today’s needs. The most important function of the cemetery board is to foster a better understanding of the cemetery and improve communication within the Parish community. St. Matthew Cemetery board is currently in the process of creating a data base to more securely store records. This data base will allow us to have a safer and much quicker record storage and retrieval process. Future needs of St. Matthew cemetery include the update and repair of the roads in the cemetery, roof replacement of the garage, miscellaneous repairs to the garage, and a new lawn mower. 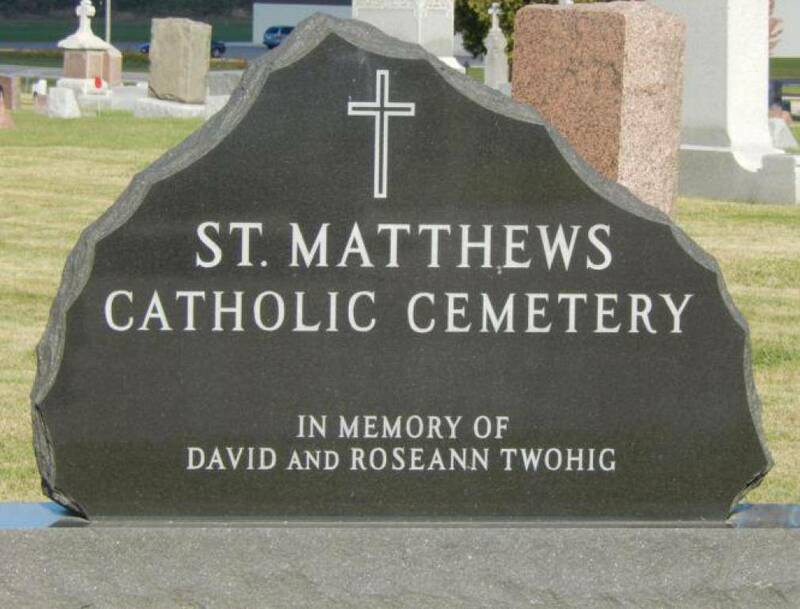 Please consider making a donation to St. Matthew Cemetery so that we can continue to provide the people of St. Matthew Parish a cemetery they can rely on. All donations received will be used to help cover costs for current and future cemetery ground maintenance needs. • The Sexton of St. Matthew Cemetery shall superintend the digging of all graves and placing of all vaults. No person shall be permitted to dig in the cemetery or lay foundations. • All monuments and markers, grass level or otherwise must have a concrete foundation with a 4” border around base of monument. The size of the foundation (consider the 4” required border) will determine the largest size monument allowed, without first getting special permission from the Cemetery Sexton who shall be the final word. A single grave foundation must not exceed 44” x 28”, a double grave, 96” x 28”; base and tablet not to exceed 36” in height. Under special consideration the Cemetery Sexton will allow larger monuments, but we want to make it clear, do not order a larger monument without first contacting the Sexton; who will then explain the special problems and the special consideration expected by the Cemetery Board. • Only one monument will be allowed upon a lot, per owner. • A maximum of two cremations will be allowed per lot. • No person shall be allowed to plant shrubs, bushes, trees, or flowers on graves or lots. Lot owners who have live flowers and then fail to have them properly maintained are hereby notified that the Board reserves the right to have removed all neglected plants from the beds, graves, vases or urns as soon as they become objectionable to the surroundings, also flower pots and pans when empty. • No corner markers, curbing, platforms, steps, fences, hedges, or other enclosures will be allowed on any lot. Should any structure now on any lot become unsightly or rusty, they shall be removed from the cemetery by the lot owner on notice to that effect. • All flower arrangement or memorabilia should be placed on monument or on the base of footing. Glass and tin present a hazard; composition and plastic quickly become unsightly. These type containers will be removed at once, without further notice. • Artificial flowers are not forbidden but they are objectionable; they are a target for vandals and the winds. They can ruin a lawn mower and they do fade in color quickly and become unsightly. If you choose to use them, we ask that you inspect the grave site monthly. • All flowers and decorations must be removed by October 15th of each year. • Christmas and other winter decorations must be removed by April 1st of each year. • St. Matthew Cemetery is not responsible for any personal articles left at the grave site. Although we do all in our power to prevent theft and vandalism of grave sites, we cannot be held responsible for property lost, damaged or stolen from the grave sites. • Damage or wear and tear of a monument is the responsibility of the owner. • Children under twelve years are not permitted in cemetery unless accompanied by their parents, guardians or some responsible person. • Cemetery roads are not plowed in winter unless there is a burial. • All persons are prohibited from plucking any flowers, whether wild or cultivated, breaking or injuring any tree or shrub, or defacing any tree or landmark. • No person will be permitted to use boisterous or profane language or in any way disturb the quiet and good order of the cemetery. • No driving is allowed on lots, or upon the lawns, under any pretense whatsoever. • No person will be allowed to loiter in St. Matthew Cemetery after nine o’clock at night. • Dogs and other pets must be on leash. Cleaning up after one's pet is mandatory. They must not be allowed to intimidate other visitors and deface property. • Violations shall be handled as any other fine and will be handled by the civil authorities. • All persons are reminded that these grounds are sacredly devoted to the burial of the dead and a strict observance of all that is proper in a place so dedicated will be required of all who visit it. The penalties of the law will be strictly enforced in cases of wanton injury or disregard of the rules and regulations. Visitors will confer a favor by informing the Sexton of any breach of the rules that may come under their observation.